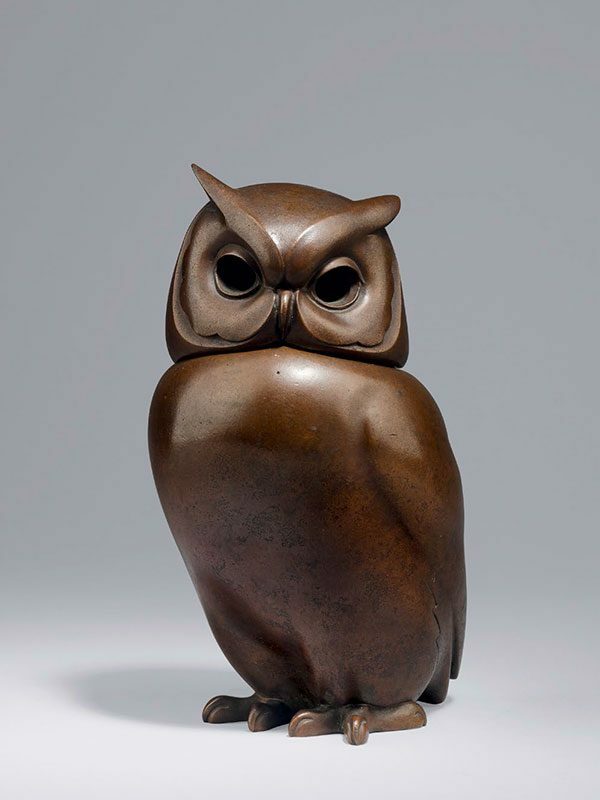 A bronze container or incense burner, cast in the form of a seated owl. The head is removable, and the metal has a soft patination. Signed: Eiju. With the original tomobako, inscribed to the top: chudo (cast metal) and inside: Matsunuma Eiju saku, with the seal Eiju (Made by Matsunuma Eiju (Tsuda’s surname before he was adopted by the renowned metal artist Tsuda Shinobu was Matsunuma), with the seal Eiju). Tsuda Eiju (1915-2001) studied under Tsuda Shinobu (1875-1946), who adopted him as his heir. He was accepted by the Japan Fine Arts Exhibition (Nitten) many times and received a grand prize in 1962. Eiju is known primarily for his bronze vases, but the animal theme is also a popular one with this artist; he is known to have made an incense burner in the form of a monkey and an okimono in the shape of a crane.